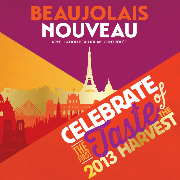 By all objective measures, Beaujolais Nouveau wine is terrible. It has a less than favorable reputation in France and among fine-wine enthusiasts, who liken its quality to that of a certain brand of box wines popular with the collegiate crowd. Unlike other famous French varietals which improve with age, this wine does not. But every year 49 Million liters, about 65 Million bottles, of Beaujolais Nouveau are produced and sold in the short 6-8 week period. Half remains in France with the other half being exported to Japan, Germany and the U.S. where it has enjoyed popularity as a Thanksgiving wine due to the proximity of the holiday to the wines release date. So how does a young, tannis-lacking wine, with virtually no shelf life, everything a fine wine is not, become one of France's greatest exports? Its simple: clever marketing. Every year around the holiday season, on what has become Beaujolais Nouveau Day, Beaujolais Nouveau wine is hastily shipped by plane, just a few weeks after harvest and production, to markets all across the world to be sold exactly at 12:01 AM on November 21st. Despite this being a wine of less-than-excellent quality, clever marketing schemes in the 60's and 70's played on the growing popularity of the product by highlighting the rush to export the wine all over the world. The quick turnaround time, roughly 6-8 weeks, has also played a role in the marketing success of this wine. After all, something being done with so much urgency certainly has to be an indicator of importance, at least it would seem that way to your average consumer. About one-third of the wine produced in the Beaujolais Region, just North of the city of Lyon in the Eastern part of France, is Beaujolais Nouveau wine. Every year wineries producing this varietal will export about 47% of their harvest, generally making this the largest proportion of their wine exports. Beaujolais is a red wine made from hand-picked Gamay grapes, that is fermented for only a few short weeks before it is ready to drink. Unlike Premier Cru's and other famous French varietals which improve with age, this wine is intended to be consumed immediately and has little to no shelf life. As with anything the quicker the production, the greater the profit. Vigneron Georges Duboeuf, recognized this income potential and began staging an annual race to Paris among the regional producers to draw further attention to the Beaujolais Nouveau. The race has become an unofficial national event drawing large crowds who come to see over one million cases of the wine being transported to Paris by motorcycle, hot-air balloons, rickshaws and even an elephant. The plan was so successful that the French Newspaper, Le Figaro, called the export race "the greatest marketing stroke since the end of World War Two", and the numbers back this up. Successful marketing campaigns are dependent upon a few key factors - opportunity identification, the creation of new and attractive solutions, and the ultimate delivery of a product or service. As exemplified by the Beaujolais Nouveau wine, a well developed marketing campaign that takes into account all of these factors can sell almost any product. If clever marketing can sell bad wine, imagine what it can do for products and services that are actually good.